Another year of baseball has come and gone for 22 cities. This one was a very noteworthy one for the beloved Pittsburgh Pirates. They gave their fans a taste of first place in July for the first time since 1992. Although they completely collapsed down the stretch, they finished with their best record (72-90) since 2004. Instead of focusing on the huge negative that is the team’s 19th consecutive losing season, I’m going to take this space to focus on the memories that this season left me with by thanking the players. There were plenty. 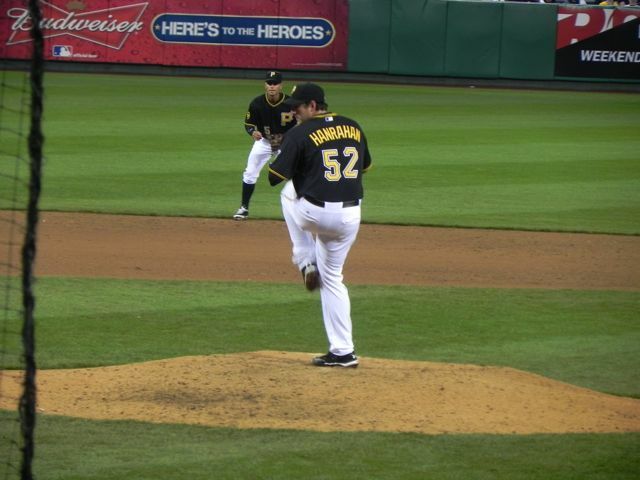 Joel Hanrahan- Thank you for being the shut-down closer this team envisioned you being when they traded for you in 2009. I’d take you over Nyjer Morgan in a heartbeat. Pedro Alvarez- Thank you for keeping it cool this year, even though it was a lost year. You took a nearly radioactive situation with your struggles and the reaction of the fan base and kept it from getting out of control. Clear your head up and come back ready in 2012. We need you. Jose Tabata- Thank you so much for having a love for the Pirate franchise. It showed when you signed your extension this summer. You know the great history of this team and want to be a part of it. How can you not like that? Paul Maholm- Even though this was most likely your last year with the club, thank you for being a great pitcher to watch during your time here. No matter what kind of crap you were faced with, you took the ball and tried to do your job to the best of your ability every time out. Not one complaint or excuse. It’s something I feel the younger pitchers fed off of. Jeff Karstens- Thank you for showing in this era of obsession over power arms that a pitcher with control can get the job done too. Keep up the good work. 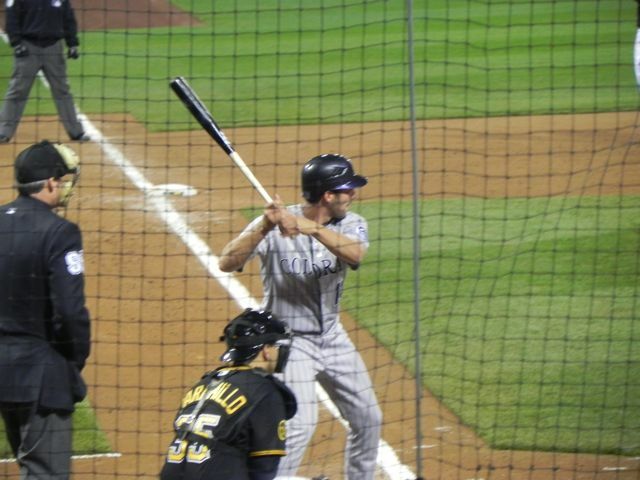 Michael McKenry- Thank you for making grown men cry on the night of July 8th, 2011 just by hitting a home run. Seriously. 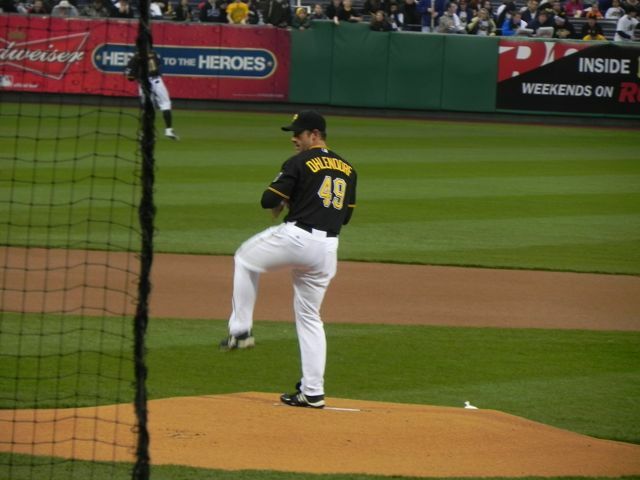 Charlie Morton- Thank you for not giving up when it seemed everyone else had done so. One of the best stories of this season. James McDonald- Thank you for being the lighthearted guy on the team. Your goofing around even made the 10-0 losses watchable when they cut away to you and the other guys in the dugout. Neil Walker- Thank you for carrying this team at times when no one else could get it going. You were a catalyst all year with clutch hitting. You are a fun player to cheer for. Andrew McCutchen- Thank you for having the breakout season that we were waiting for. You are a true “star-level” talent and it showed this year. While you faded down the stretch, you are quickly turning heads in the baseball world. Clint Hurdle- Thank you for coming into what many consider an impossible situation and bringing hope back to this fan base. Your interactions with fans and players have meant a lot and went a long way to bringing back the positive vibes this young team desperately needed. You believed, so then we believed. 187 days until Opening Day 2012. 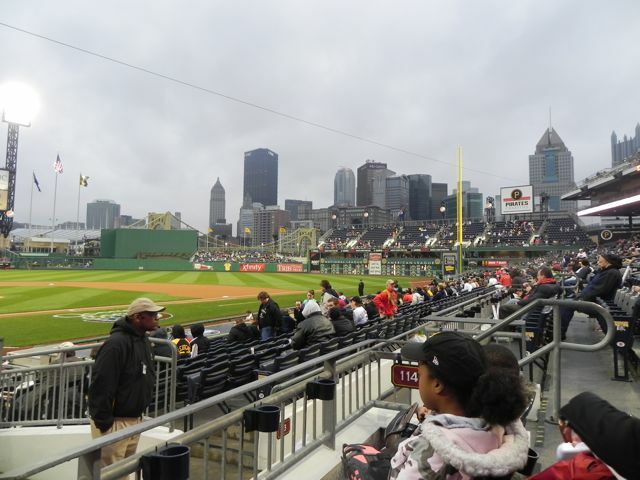 Five hours and 11 and 1/3 scoreless innings from the Pirates bullpen later, the remaining crowd at PNC Park got their chance to enjoy the first home win of the season, with some unlikely events deciding the game in the end. 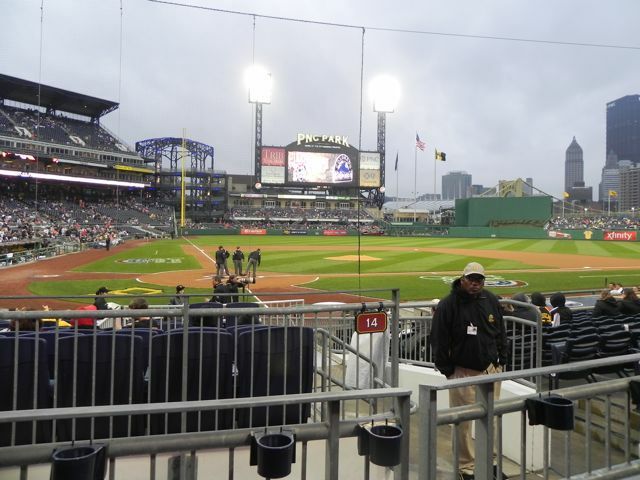 With the weather being as crappy as it was, I only got to my seats minutes before first pitch. With the weather so bad, I was surprised at how many people showed up. 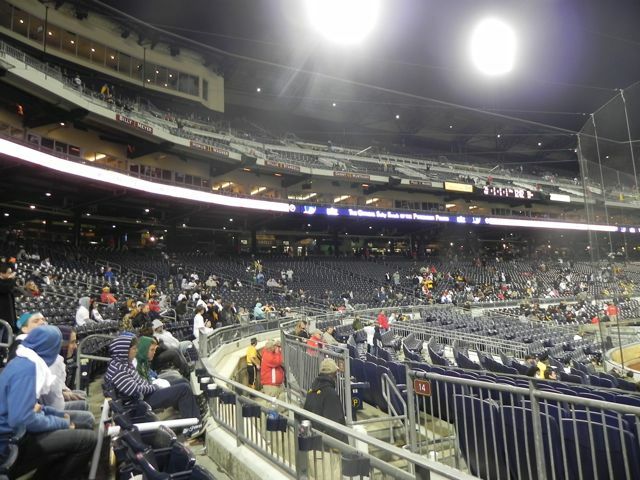 Being “Buc Night” most of the seats in the stadium were sold for $1, which aided attendance. Ross Ohlendorf took to the hill, where he was looking to snap out of his early season funk. It wouldn’t happen in the first, as after a lead-off walk and single by the first two batters, Jason Giambi took a 1-2 offering and crushed it into the seats, giving the Rockies a 3-0 lead. Something was definitely up with Ross, as in the third his pitches began losing velocity. After recording two outs in the third, he called on the trainers to check him out, and he couldn’t continue. Things looked bleak. Not even one of my favorite SNL sketches of all time could keep me from feeling uneasy as the new pitcher warmed up. Luckily for the Pirates Jeff Karstens was able to answer the call, getting back control of the game with a solid long relief appearance. 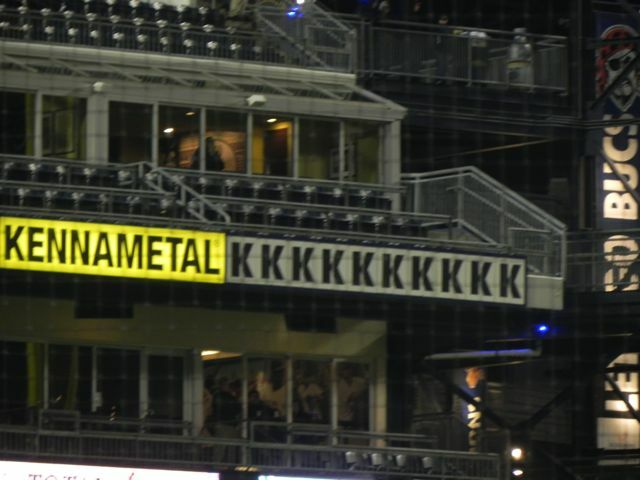 It would set the tone for the rest of the bullpen’s pitching the rest of the night. 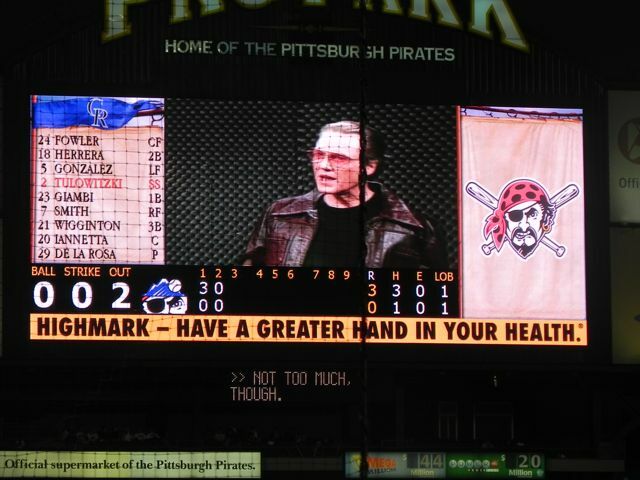 The Pirates offense would get out to a slow start. But they started to get patient with pitcher Jorge De La Rosa, and it would pay off. Their first run of the game came after two walks and productive outs scored a run in the fourth. 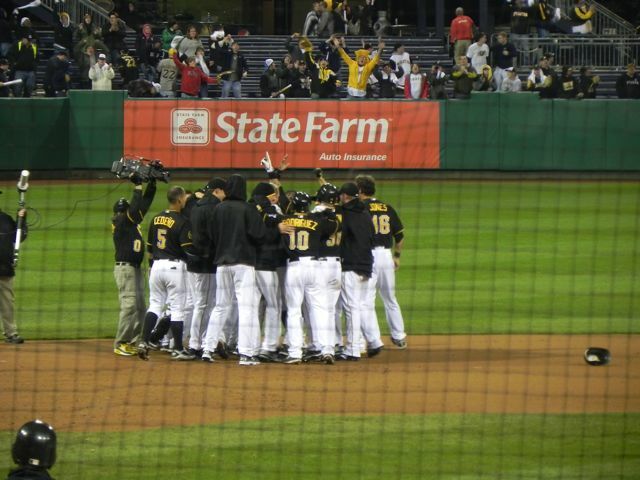 In the fifth, Jose Tabata got the Pirates some momentum back with the first bucco blast at PNC in 2011. With the momentum in hand, and Rebecca Black’s “Friday” being the rallying cry, Jason Jaramillo, who struggled mightily in 2010, came through in the clutch hitting a key single to nod the game up at three. Jose Veras and Joel Hanrahan mowed down the Rockies in the 8th and 9th. The Pirates pitchers were baffling the Colorado hitters. The Pirates blew a chance to win it in the 9th when Steve Pearce got a one out singe. A wild pitch moved him to second, and shortly after Jose Tabata grounded out moving him to third. With the crowd on their feet, many of which were waving the free shirts given out, the Pittsburgh Kid Neil Walker came up short by striking out to end the threat. Though there were some tense moments later in the game. Chris Resop was able to get out of some jams, with some timely defense, primarily from Pedro Alvarez. The game went deeper and deeper into the night. Neither team could push the run across. The teams’ bullpens and benches were running low. Closer Huston Street even got an at-bat for the Rockies. The few remaining fans had braved the cold for over five hours to see the Pirates come out victorious. After getting through the 14th inning stretch, the Pirates appeared to be heading down in order and we would be heading to the 15th. That would not be the case however. Josh Rodriguez drew a walk, and then reasons that we’ll never understand, the Rockies decided to pitch to Jose Tabata with pitcher Garrett Olson on deck. Being the quick-thinking manager he is, Clint Hurdle sent up Andrew McCutchen to the on-deck circle in an attempt to fool Colorado. I noticed this, and Cutch wasn’t wearing batting gloves. 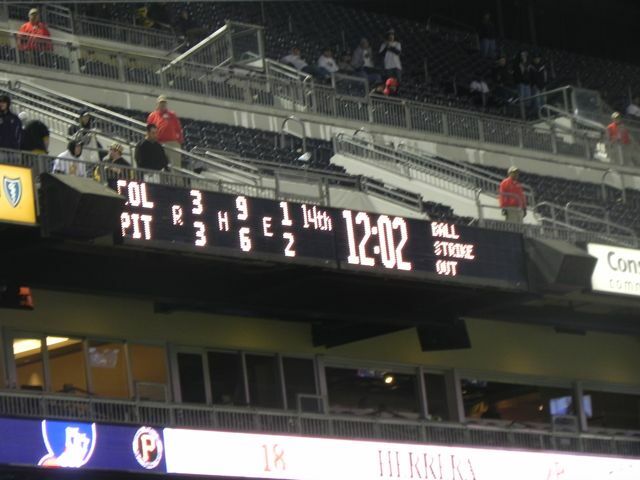 Fooled or not, the Rockies gave Jose his pitch to hit, he nailed it high off the Clemente wall, Rodriguez scored and the Pirates came out victorious for the first time at home in 2011.